Dear brothers and sisters: Today we celebrate with excitement the canonization of Archbishop Romero. We knew that he was a saint from the outset and we waited anxiously for the official declaration of the Church regarding his sainthood. This is the day. And we cannot help but start by quoting our Lord Jesus Christ, our teacher and teacher of Archbishop Romero. When Pilate was judging him, Jesus told him, “I have come into the world to bear witness to the truth.” (C.f., John 18:37.) Today we can affirm that God sent Archbishop Romero to El Salvador to be, like Jesus, a witness to the truth. A witness to the faith in the slain Lamb that remains standing, as the Book of Revelation refers to Jesus (C.f., Revelation 5:6). A witness and an apostle who follows in the footsteps of Lord Jesus in his life, in his word and in his ability to judge the Salvadoran situation. Archbishop Romero, witness of the Lord, continues to illuminate our hunger and thirst for justice. He gives us the hope that the blood of so many innocent victims will become for us the foundation and the basis of an El Salvador built on respect and dignity for all, especially of the simplest and most humble. In a time when the poor were despised, exploited, manipulated and considered inferior in our country, Archbishop Romero identified with them and their causes. His life was a testimony of God's preferential love for the poorest, struggling alongside them, peacefully and prophetically, on behalf of their rights. In the beatification decree he was rightly called “Father of the Poor.” And this was how he demanded justice for peasants and workers, supported their demands and their popular organization, and defended them against the hatred and violence of the powerful. But in addition to siding with the causes of the poor, he lived with them in the Little Divine Providence Hospital. There, the place of lodging and perhaps death for the poorest cancer patients of our country stay, there lived, in poverty and simplicity, also our martyr bishop. There he accompanied the suffering of the sick who had no other recourse than the generosity of the sisters of the Little Hospital, and he encouraged them with the consolation of a God, our God, who never abandons the weak and the afflicted, and always offers them the solidarity of all of us who pray the Our Father wholeheartedly and fervently wish that His Kingdom come. Before, when he was Bishop of Santiago de Maria, he had opened the doors of the cathedral so that the coffee cutters, who came from far away to that land of coffee plantations, could have a roof to sleep under. The photographs of Romero with children who play with his pectoral cross leave no doubt of his tender closeness to the poorest. That loving closeness to the poor, along with his faith in the Lord Jesus led him to be a prophet of justice. Voice of the voiceless, with no other force than the power of conscience, with no other law than love of neighbor, and no other patron than the Divine Savior. His only weapon was the Word. Archbishop Romero, our Saint Romero, with his warlike word in defense of the oppressed, would reduce those who killed the poor, who persecuted their organizations, or threatened to kill anyone who showed a firm desire for social justice to writhe with rage. Like Jesus, he was hated by those who could not stand the good news of a loving God who created brotherhood. His word displeased the neutral and the indifferent and irritated the hypocritical collaborators, who masked and concealed from within the institutions of the state, the barbarism of the death squads. And in the face of hatred and attacks, he always responded with the same words from Jesus on the cross: “Father forgive them, for they know not what they do.” (C.f., Luke 23:34.) His love extended to everyone, healing those wounded by injustice and speaking the truth to the victimizers. Two classic ways of love that are always demanded by the Church, in harmony with our God, who is love, and calls us to console the victims and to be prophets in front of those who abuse their neighbor. Archbishop Romero recalls the terrible difficulty that those who put their hearts in riches have in entering the Kingdom of heaven. Our saint, full of the Spirit and wisdom of the Lord, would strip the intentions of the proud with the weapon of his word, like a double-edged sword. He reminded the rich that the idolatry of wealth was at the base of Salvadoran injustice. He reproached the powerful for using death as an instrument of power. And he reminded the popular organizations that they could not put the organization above the rights of the people. Every idolatry puts the law of the strongest in the first place, instead of love of neighbor and evangelical solidarity. He did not talk about giving but of sharing. Because when the rich give something, they are not giving of their own, but what belongs to everyone, and especially to the poorest. To the poor to whom the Lord promised the Kingdom of heaven and in whom the face of Jesus is always present. Always taking his inspiration from the Gospel and from the Social Doctrine of the Church, from the universal purpose of material goods, from solidarity and social participation, our saintly archbishop worked with a deep desire for peace with true social justice. He also recognized that peace can only be built by denying idolatries, restoring to the victims their dignity as human beings, restoring the rights of those who are stripped of them and systematically working to eliminate suffering in the world we live in. Today his voice continues to resonate, with increasing force throughout the world. From the outset, various Christian Churches expressed their solidarity with him. And after his death, many of us considered him a martyr. Among them, Archbishop Rivera, Maria Julia Hernandez, Mgr. Urioste and many friends, today in heaven, who never have forsaken him. The Churches that accompanied us in devotion to Romero from the beginning are here today in the joy of the canonization, celebrating everyone’s saint along with us. Thank you, brothers and sisters, for your presence! They have also contributed to the fact that Romero's name has become universal. His relics have reached remote dioceses in Africa and his image or portrait has spread to churches and cathedrals of various Christian denominations. And as if that were not enough, the United Nations has declared March 24 the International Day of the Right to Truth in relation to Serious Violations of Human Rights and the Dignity of Victims. In other words, the UN is recognizing our Saint Romero as the universal patron of the victims’ right to the truth. He, who was so bravely and so courageously the voice of the voiceless, is today a resurrected victim who defends the victims of history who long for and await resurrection. 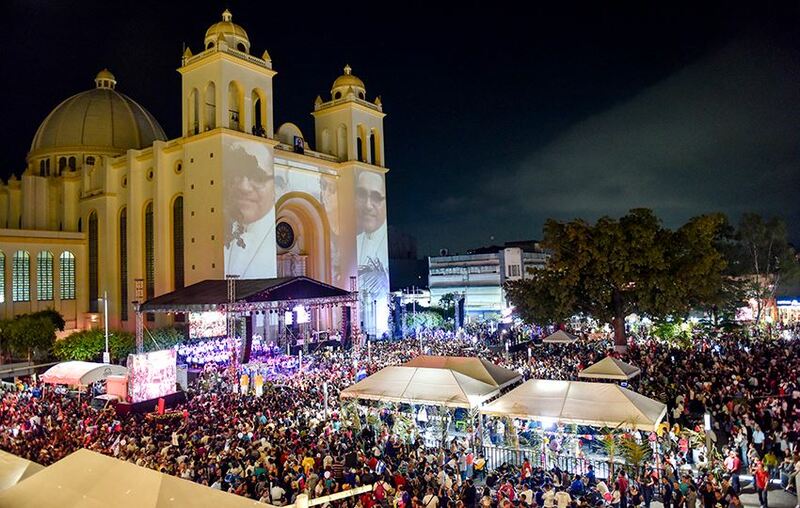 Archbishop Romero, Saint Oscar Arnulfo Romero, already arisen in the power of the Holy Spirit, arises in the world and continues to arise among us and within us, his Salvadoran people who seek justice and fraternity. His voice resounds louder today, demanding a world without victims, free from the suffering created by the Cains of history. In the readings we were told that nothing and no one can separate us from the love of God manifested in Christ Jesus. (C.f., Romans 8:38-39.) Archbishop Romero is a living and evident proof of the love of God who never tires of loving and blessing his people, sending them saints and prophets. In the gospel we have heard Jesus tells us that he puts his disciples in the hands of God so that they may feel the fullness of joy. (C.f., John 17, 11b-19.) That same joy is transmitted to us today by that exemplary disciple of Jesus of Nazareth, who today we jubilantly call Saint Arnulfo Romero. Before this sainted Romero, prophet, pastor and loving father who cares for his sheep and protects the rights of the impoverished of our land, we Salvadorans must have a look at our personal and social reality. Romero took seriously the will of the Lord Jesus when he told his apostles and us to love one another as He has loved us. (C.f., John 13:34.) That is why his spirit has risen and lives in his people. He wants to live in all of us and insists that we must be self-critical. He wants us to ask ourselves if we follow Jesus Christ and so many generous witnesses of the faith before us who put the Gospel at the center of their lives. He asks us, from the perspective of the Gospel, the Lord and his saints, to overcome selfishness, inequality and consumerist individualism, in which the idolatry of money is concentrated today. Archbishop Romero asks us to work for a society in which a Christian, generous and fraternal spirit is above the desire for individual profit. Like Jesus did his disciples, he reminds us that whoever wants to be superior must become a servant and slave to others. (C.f., Matthew 20:16.) We Christians are not permitted to compare ourselves to others and believe ourselves superior. That path leads us to despise the simplest and the poorest. To close our eyes and our hearts to the needs of our neighbor is neither Christian nor worthy of people who venerate Saint Romero of the Americas. To rejoice with the holiness of Romero, to love and respect him as a saint and as the most universal Salvadoran, is to commit ourselves to follow Jesus Christ, alive in our brothers and still crucified in the poorest of the poor. For that same reason, the prophetic example of Romero impels us to look at our society and to work for its transformation. We do not want, nor can we allow, the imposition of laws that allow the poor to die of thirst, as our bishops warned us. We do not want a society in which corruption resides in the spheres of economic and political power. Nor do we want a judicial system that is weak with the strong and strong with the weak, that continues, as Romero said, biting only the foot of the one who walks barefoot. This is called judicial corruption, as our saint Romero once told the Supreme Court of Justice. Our holy shepherd invites us to review and increase a minimum wage that is not enough to live on. He asks us to formalize and protect informal labor, which today keeps almost half of El Salvador’s economically active population in permanent vulnerability. He calls us to demand decent schools for forgotten villages or where schools have been damaged by the passage of time, rains and official neglect. And he asks us to overcome an unjust and obsolete public health system that separates and gives different quality of service to those who pay Social Security contributions and those who cannot contribute. Health, water, education, decent work and dignified housing, are the rights of all. As Saint Romero said, we have to change things from the root. We do not venerate a corpse but someone who is alive. Alive with God and in the hearts of all Christians who want to follow the Gospel radically. Our Saint congratulates us today and is happy with his Church because it has pressed for an increase in the minimum wage, because it has promoted the suppression of metallic mining in El Salvador, and because it continues to press for the water to protected by everyone, is provided to all, so that we can say that it belongs to everyone and not to just a few. But he also asks us to work intensely to overcome and defeat the existing climate of violence, which causes so much pain and suffering. Repeating the words of the prophet Isaiah that he liked to cite, he demands that we turn weapons into instruments of work (c.f., Isaiah 2:4), he encourages us to promote decent work for all, and especially for the young. Only this way, with young people trained for decent work and a just wage, will we overcome the violent plague inherited from the madness of a fratricidal civil war and multiplied later by inequality and social injustice. Our saint was right to say that there is a violence superior to the arms of the guerrillas and the tanks of the army: It is the violence that one does to oneself against every desire of death, exploitation, abuse or revenge. Without brotherhood, there is no future. And that is why Romero asks us to nurture the family as a source of peace, generosity and service. Demanding protection, support and services for families in poverty and vulnerability from the state prevents violence. Archbishop Romero talks to us more about rehabilitating criminals than dealing with them with an iron fist. He demands decent pensions for our elders and denounces the terrible marginalization that women suffer when their efforts to take the family forward are ignored and they are denied the right to a pension as fair compensation for the work they do at home. Jesus of Nazareth tells us, “I am the light of the world.” (C.f., John 8:12.) Archbishop Romero is a luminous martyr, the light of a new society in which the poor recover their dignity and raise their voices. As the first reading stated, his life shines among us with the force of the fire in a cane field. (C.f., Book of Wisdom 3:7.) It spreads a fire that nobody can contain. A man like Romero, who systematically fought against human suffering and who accepted the suffering of an unjust death to defend the poor and the unjustly persecuted, shows us the light of Christ and the way to build a new history in El Salvador. He overcomes and shows us day by day the power of goodness. While the tricks and lies of those who insulted and offended him turn into cobwebs in the forgotten corners of history, he has become the most universal Salvadoran. The Pilates, the Herods and the Caiaphases who murdered Jesus, are now mere memories of dark, weak people condemned to historical insignificance. The same goes for those who killed Romero. While they, the killers, pass to the dark pages of ignominy and oblivion, he shines as defender of the rights of the humble, as an increasingly powerful voice that invites us to defend the life and dignity of all. And not only in El Salvador, but in Rome and throughout the world. And that is why our Saint Romero is the motor and guide of our hope. Living in circumstances that were worse than ours, he never stopped hoping for a better tomorrow. But he left it in our hands, in the hands of his people, to forge a different future. He had the daring and courage of a prophet and the heart of a saint. A heart open to the needs of the poor and to the desire for peace of all people of good will. That is why he sought the reconciliation of everyone in El Salvador, empowering the poor with dignity, and demanding justice and peace. From his sainthood, he continues to invite us to that same reconciliation, built on truth, justice, the reparation of the victims and the generosity of forgiveness. Truth without justice and without reparation of the victims ends up becoming a farce. But reconciliation would not be authentic if we fail to establish mechanisms that offer ways of forgiveness that do not deceive justice. A forgiveness that only the victim can give, because she is morally superior to the executioners and always has a more generous heart than the killers do. Archbishop Romero was killed while celebrating the Eucharist. Even before March 24, they had tried to eliminate him by putting a bomb under the altar of the Basilica of the Sacred Heart, where he was going to celebrate his Sunday Mass. There was an obvious hatred of Archbishop Romero’s priestly service. But the assassins did not realize that by killing the archbishop in the Eucharist they were definitively uniting him to the blood shed by the Lord. Jesus gave himself over to us as food in the Eucharist, asking us to remember his death and his resurrected presence among us in the bread and the wine. When we celebrate the Mass again today, excited at this historic moment for our people, let us not doubt that the presence of the Lord is always with us. He is with us in the bread of the word of God and in Romero’s firm word. That word of his homilies that characterizes him as a true Doctor of the Church. The Lord remains with us in the bread that we share and in the wine with which we toast the joy of the resurrection. He is also with us in the life of Romero, united to the resurrection of Christ and shared with us. Jesus, the Christ, is in the lives of all the martyrs and victims of El Salvador, even the most anonymous and forgotten ones. Together with Romero, they celebrate in heaven the strength of the Holy Spirit, the Spirit of God, who has enlightened the mind and heart of our Pope Francis to give to the universal Church, and to the Salvadoran people, the proclamation of our Saint Romero of the Americas as a saint, martyr and model of life. May this Eucharist, joyful now on earth and united with the joy of the martyrs in the Kingdom of God, unite us to all the poor and afflicted of the world. That it may renew, in them and in us, the hope for a more just world. And may it also unite us to the Universal Church in which holiness always flourishes when we open our hearts to our brother or sister who is in need. Long live the martyred Church of El Salvador! Long live the Salvadoran people with whom it is not hard to be a pastor!